Another installment—the 15th, to be exact—of the Independent Film Festival Boston (IFFBoston) has come and gone, and while I am tempted to preamble my roundup by musing on the nature of festivals, film-overload, or the atmosphere (delightful and full of easy access to beer, as always), there were so many quality films this year that I don’t want to waste any space waxing cinematic when I could be talking about the movies themselves, and why you should see them. From opening night selection Stumped, which chronicles the struggle of quadriplegic stand-up comedian and eventual arm-transplant recipient Will Lautzenheiser (who, by odd coincidence, was once my screenwriting professor at Boston University), to Band Aid, Zoe Lister-Jones’s closing night film about a couple attempting to heal their relationship by breaking out the guitars, IFFBoston offered a slate of diverse, moving, hilarious, and insightful narratives and documentaries. Of what I saw—and no matter how well I could schedule, there was simply no way to see everything (so please don’t take the non-mention of a film as a slight against it)—these are the films that brought IFFBoston 2017 to life, all of which you should keep your eyes peeled for. City of Ghosts was the most difficult film I watched at the festival and unquestionably the most important. It’s a documentary that follows the effort of the activists and journalists operating the website “Raqqa is Being Slaughtered Silently” (RBSS) to expose the horrors that ISIS has brought to their hometown of Raqqa, which—during the ongoing Syrian Civil War—has become a sort of de facto capital city for the extremist caliphate. It is of our time—the age of terror, and refugees, and threats of bans and walls—and of all time, documenting how cruel man can be, but also how brave. The individuals reporting for RBSS operate from Turkey and Germany, as well as through sources on the ground still inside the city. Many of the members featured in the film have been forced out of Syria—ISIS knows who they are, and has threatened their lives. In some cases, ISIS’s inability to capture the activists themselves has led them to kill family members as revenge. We see a son watching his father executed on camera. We hear a man describe his brother, fleeing the country only to drown at sea. The camera never flinches; above all, RBSS’s mission is to document the horror that most of us only read about or hear tossed back and forth as a political football. It is one thing to read about an execution, or see photos of the aftermath; it is another to watch a stealthily taken video of a group of men, all lined up kneeling, being summarily shot in the back of the head in front of a crowd. It is something else to see decapitated corpses left out as a warning for those who oppose the caliphate. We want to look away—in fact, that’s usually our gut instinct once we realize that the film won’t spare us—but we should not, and neither should the film. The members of RBSS have risked everything and oftentimes lost everything to show us what is happening to their city, their family, their friends. More than once, over the course of the documentary, they learn that another of their journalist-brothers has been killed. We need to look because of what it took for them to get this footage to us; we need to look because we cannot talk about Syria without looking and seeing what is happening to these people. And most of all we need to look because these people—the citizens of Raqqa and the members of RBSS—are exactly those that our government wishes to ban from entering the country as refugees. There is much horror in City of Ghosts , but the most troubling moments aren’t the executions. It’s the footage of an anti-immigrant rally in Germany, where we see Syrians confronted and harassed by those who have no possible idea what they’ve escaped from. If we succumb to that, if we look at another person and see something less than human, then perhaps we’re no better than those holding the executions. There’s no easy way to transition away from a film as heavy as City of Ghosts, so I’ll paraphrase Rob Brydon’s words, uttered midway through The Trip to Spain, when he asks Steve Coogan, rather politely, if they can stop talking about ISIS. 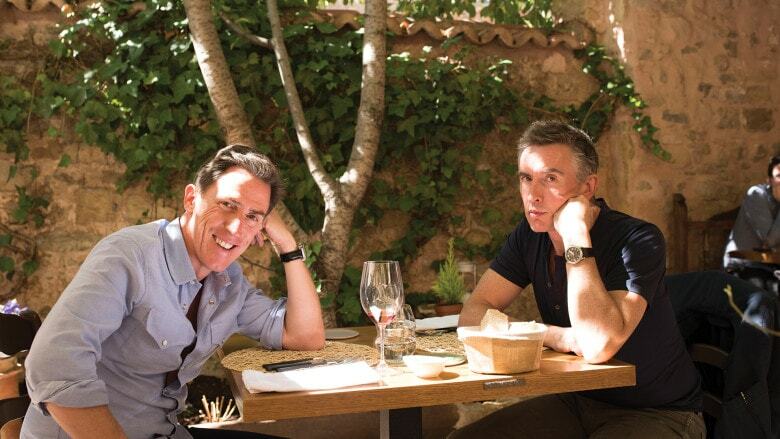 The Trip to Spain is Michael Winterbottom’s third go-round with Coogan and Brydon, and while the familiars are still in place—beautiful scenery, delicious-looking food, and a bevy of celebrity impressions—Spain takes a slightly more ambitious narrative angle. These films have always been underlined with a hint of sadness—these are middle-aged men, past their primes, and though they continue to reassure one another of all that lies ahead, time is passing, and life is growing shorter. I won’t go into much more detail than that, and despite the extra weight, you’d never confuse The Trip to Spain with a drama; it’s still about as light and pleasant of a time as you can have at the movies. While The Trip to Italy was more Brydon’s film, here Coogan becomes the leading man again, and the film glides through its two hours with such ease that you hardly notice the time passing. It’s the perfect sort of meal, completely filling, and yet, you still want more when it’s finished. The surprise of the film’s ending leads us to believe that we will, perhaps, get another vacation with these two. We can only hope. Indie as a genre is typically defined by a certain feel (besides, of course, the budgetary restraints), and one of the joys of a festival like this is when you find a film that turns your indie expectations on its head. Dean, the first film from director/writer/actor/comedian Demetri Martin, does just that. Its construct is simple and familiar—a young man and his father go through an emotional rift after his mother dies—but Martin is wise enough to know the game he’s playing and change the rules just enough so that it doesn’t feel like the kind of film that’s relegated to a barely promoted release on Netflix (or any other streaming platform). His character (the titular Dean) is an artist, and throughout the film, his illustrations find their way into the frame, mirroring, mocking, or exposing Dean’s true feelings on a situation. It’s a clever trick, and paired with a few others and a script that refuses to look for easy solutions, it helps Dean feel fresher than you might expect. It might not be a perfect film, but it’s a strong showing for Martin’s first directorial effort, and should be the first stepping stone into a solid career of filmmaking, should he choose to keep making movies. Two standout performances powered a pair of films that looked at the lives of unexpected outsiders. The first, Patti Cake$, follows a young woman named Patti (go figure) in Nowheresville, New Jersey, trying to make it as a rapper along with her two misfit friends. She’s an easy target for naysayers and bullies (often from within her own family)—overweight, female, white, and poor—but she’s determined, and played with such conviction by Danielle MacDonald—especially in rap-battles and on-stage sequences—that it’s impossible to root against her. The script gives her the rhymes, but MacDonald is able to deliver the flow with astonishing power. It might not be the most unpredictable movie, but it’s hard not to love it, and it opens up a pretty interesting conversation about who gets to do what within the rap world. The second film, Menashe, was a quiet, sad, and lovely look at a single father named Menashe (again, go figure) trying to raise his son after the death of his wife. The complication being that Menashe is an Orthodox Jew, living in a tight Orthodox Jewish community, whose rabbi wants his son to stay with Menashe’s brother-in-law until Menashe marries again. Menashe isn’t afraid to question Orthodox ideology, but to get his son back, he’ll have to go along with it. Such is the way of the world he lives in. It’s a simple conceit and a fascinating look at a way of life we rarely get a deep look into, and like Patti Cake$, the film soars because of the devotion that Menashe Lustig throws into his performance in the main role. He is by turns hilarious, infuriating, pitiful, and heartbreaking. A scene late in the film where he discusses his marriage is so raw that it feels like it should leave a scar. Lastly, there is Landline, which, having time to think about it and reflect upon all of the films I saw, stands out as the best. Landline brings back the team that put together 2014’s excellent Obvious Child, director (and co-writer) Gillian Robespierre and actress Jenny Slate, to trace the trials of a small New York family over the course of one 90s summer after two daughters (Slate and a very good Abby Quinn) discover that their father (John Turturro) is having an affair. They wrestle with whether to tell their mother (Edie Falco), while also dealing with the crises of their own lives. The potential disintegration of their family hovers over their every action, whether they expose their father or not. Again, this isn’t a spectacularly unique subject matter, it’s just crafted and executed with such precision that it feels like lightning. Robespierre has such a gift for writing fully human, devastatingly flawed characters, and Slate is so natural with her comedy—it takes a special sort of comedian to pull off a California Raisin Halloween costume without making it feel forced—that even though we recognize the performers, it feels like we’re watching a real family. A supremely odd one, perhaps, but still, a real one. Obvious Child was one of my favorite films of 2014; Landline looks like a strong contender as a favorite this year. More importantly, it’s time we started to include Robespierre in any conversation about the best young filmmakers in America. She’s no longer up and coming, she’s here, and we’re all the better for it. There were, of course, other great films and outstanding performances, too many to mention in a single article. There was the all-encompassing and weirdly existential documentary Rat Film; there was a towering performance by Sam Elliot in The Hero that dragged the entire film around him to a higher level. It was, as always, a fantastic festival, and as usual, it left me eager to see what they have in store next year.